Recession. Recession. Recession. In Canada, Belgium, Czech Republic, Italy, Japan, Portugal, Taiwan, Slovenia, the Netherlands, Brazil and Russia. They’ve all either had recent recessions, are in deep danger, or have one now. Who’s next? Not us. We hope. Australia has dodged the recession bullet for 24 years. But economic pessimists abound, predicting bust anytime soon. The BRICS aren’t looking too flash. Brazil and Russia are in recession. China’s stock market has wobbled disconcertingly. Even the US$24 billion the panicked Chinese central bank threw at the markets wasn’t enough to stop Beijing’s brokers from running for their financial lives. Speaking of BRICS, South Africa is also in deep, deep trouble. Only India appears oblivious to the carnage wracking world markets. Canada has experienced five consecutive months of economic contraction, although it has continued to add jobs, haphazardly, fuelled by the credit cards of the citizens of the Great White North. But it was the global slump in oil prices, caused by the US shale oil glut and a refusal by Saudi-led OPEC to cut production that has caused black gold prices to plummet. That’s why Canada is in recession. Got the picture? Commodity-dependent economies are vulnerable. Once the Beijing bubble began to burst, Chinese demand for iron ore – which has driven the flood of wealth into Australia for two decades – forced a rapid adjustment, leaving iron ore prices falling lower in the final two quarters of 2015. Iron ore prices are currently around US$56 per tonne, but markets are predicting sub-US$40 prices, if Chinese growth and demand continue to sink. BHP has seen its full-year profit fall 52%, as China, its biggest market, undergoes a serious slowdown. Commodity-driven economies are not the only victims of this global downturn. Japan, which emerged from recession in the first quarter of 2015, is teetering on the brink once again. Prime Minister Shinzo Abe’s “Abenomics”, once praised for its debt-driven mass infusions of capital, has produced a sake-driven hangover. But all eyes are on China right now: will it be a soft landing? Or bust? Beijing is burning its foreign exchange reserves. A record US$94 billion sell-off in the last month has reduced its reserves from a peak of US$4 trillion in June 2014 to around US$3.5 trillion in September 2015, a consequence of the Bank of China’s inept 2% devaluation of the renminbi (RMB) in early August. Devaluation sent such shockwaves through global markets that it sparked the brief – but unsettling – Chinese stock market sell-off. Capital flight followed, as bearish investors took fright and the offshore yuan was also sold off. China usually buys US dollar-denominated securities to prop up the dollar and keep the yuan undervalued to maintain export competitiveness. Not this time. Panicked, the Bank of China sought to stabilise the yuan by dumping its foreign exchange reserves in an attempt to bolster the RMB. China has experienced exponential growth for 25 years. But that has changed and China is becoming a “normal” economy, just as the Japanese post-war boom ended, ignominiously, in the heisei recession of 1992, inaugurating “western” levels of growth and unemployment. The latest economic data out of China don’t give much cause for celebration. Annualised GDP growth is forecast to be 7.3%, a mere 0.1% down on the previous forecast – but still Beijing’s weakest growth figure in a quarter of a century. But make sure you take Chinese economic statistics with a huge grain of salt; as Prime Minister Li Keqiang has told us previously, they’re merely works of fiction. Pay more attention to the import and export numbers. For August, China saw a 6.1% fall in exports and a whopping 14.3% drop in imports. That data is serious: consumers and business are buying fewer Chinese goods, while manufacturers slow down their raw materials and components imports. Chinese mom-and-pop investors in the local share market just got badly burnt. It’s safe to say they won’t be buying lots of iPhones anytime soon. Or, possibly, sending number one son to Australia for an international education. What does this mean for Australia? For a start, the China boom is so last quarter-century. As I wrote in February, a commodities-driven economy like Australia’s was always going to experience a hangover in the wake of the boom. 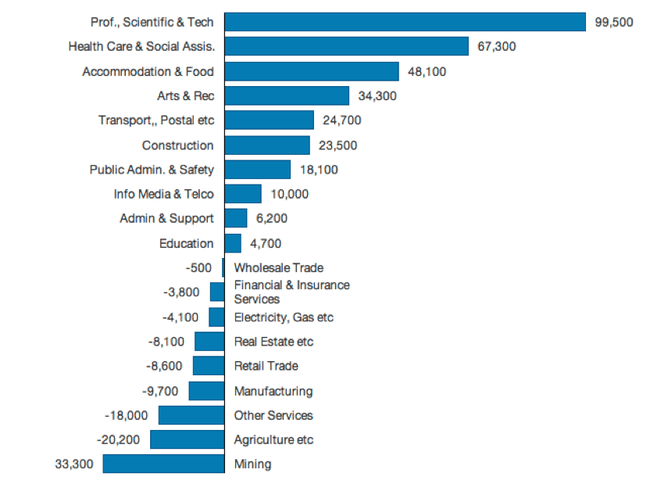 The jobs figures (May 2014–May 2015) bear this out. In the chart below, year-on-year mining employment has gone backwards. So has manufacturing, as the automotive industry enters the throes of its final shutdown. Agriculture saw a 20,000 fall. Retail, one of the biggest drivers of employment growth, is weak, as is real estate. And Chinese stock market volatility is already giving the Melbourne and Sydney property markets pause for thought. To top it all off, the G7’s Financial Action Task Force (FATF) criticised Australia last week for allowing dirty money to be laundered via its real estate market. A lot of Chinese money flows into the Vancouver property market, but the Canadian federal government is mopping up the mess with an anti-corruption probe. Result: Vancouver property is no longer the flavour of the month, and the dosh is now thoroughly embedded in the Melbourne and Sydney real estate markets. If you’re a cynic like me, you might think Canberra’s masterly inactivity over money laundering is a direct reaction to our persistent current account deficits. Rather than undertake politically difficult structural reforms, why not let China send us bags of money to buy real estate, while simultaneously stimulating a construction boom? Win-win. Frankly, both sides of politics have long been guilty of this telescope-to-the-blind-eye form of regulatory laxity. And it’s fuelled a property bubble. Even the Reserve Bank has noticed. But Australian dollar depreciation could save our bacon. Sectors such as tourism, international education and manufacturing will get a competitive bounce if the dollar stays at or below US$0.70. But that won’t be sufficient to offset reduced Chinese demand for Australia’s raw materials. Surprise. So you thought austerity wasn’t working? If you were Greece, you’d be right. But your Irish eyes would be smiling while you gazed at Dublin’s data through your Guinness glass. The Celtic tiger is back with 6% growth year-on-year, as of the second quarter of 2015. While the news in Italy (0.5%) and Finland (-1.0%) is bad, most of the EU is growing at between 1.0% and 3.0%. And even Greece grew at over 0.8%. Sort of. Why? Because Super Mario Draghi, the European Central Bank (ECB) president, has seen his €1 trillion quantitative easing (QE) program perform even better than the most optimistic central banker could have hoped. This represents a massive capital injection that’s helping drive credit, jobs and growth. Even more importantly, Draghi took up the cudgels against the US Fed’s persistent money-printing, US-dollar-devaluation strategy. In doing so, Draghi has not only increased the confidence of the EU banking and credit sectors, but he’s also driven the euro currency down to a competitive level. True, Europe’s second quarter appeared disappointing. But it was France and Italy’s under-perfomance that arrested the momentum the eurozone saw in the first quarter. Nevertheless, Europe’s performance was sufficient for the European Commission to revise growth forecasts upwards. And the EU has one more weapon in its arsenal: a depreciated currency. 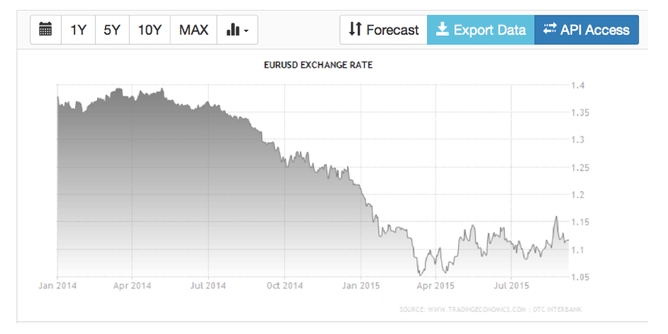 Look at the graph below: in 2014, the euro was far too high, relative to the US dollar. In January 2015, Draghi announced the ECB QE program. The euro dutifully fell. In March, QE commenced; the euro fell close to US$1.05. Enough to make EU exports much more competitive than they were only months ago. Better still, energy-dependent Europe just got a free kick: cheap oil. In my view, US shale oil and gas production is the game changer. Once the oil industry convinces the Capitol and the White House to rid America of the Nixon-era ban on oil exports, the global balance of oil power will change. Irreversibly. While US oil storage facilities are not quite full to bursting, domestic production has reduced American import demand to such an extent that other producers’ gross margins have collapsed as global oil prices have plummeted from over US$100 per barrel to nearer US$50. For Australia, low oil prices are bigger than any tax cut a stingy government can hand out. But for oil exporters, such as Russia and Brazil, the 50% fall in crude prices means recession. Even Saudi Arabia is feeling the pinch. Wondering why Iran’s finally come to table? Now you know why. But even oil is only one factor affecting global markets, and the impact of the US’s return to global oil markets is yet to be fully felt. The biggest factor that has driven the recessionary trend is not the Chinese market, austerity budgets, or even the threat of higher US interest rates this year. Arguably, the end of the quantitative easing program (QE3) by the US Federal Reserve in October 2014 has been the chief culprit behind the global economic slowdown. Why? Because for six years, the Fed’s QE programs not only poured liquidity into the US economy, but stimulated demand worldwide. Not printing money? That’s America’s own version of austerity. Certainly, the US has continued to grow strongly, even in the absence of QE. But US dollar printing drives demand, job growth and credit creation. QE caused mild inflation but, more importantly, it also delivered cheap credit, despite weak wage growth (so consumers began to rely upon credit, even as wages remained relatively static). That is not to suggest that US debt is a panacea; but the Fed program effectively reflated the global economy in the wake of the 2008-09 financial crisis, as QE resurrected demand and restored growth in the United States. It also resulted in US dollar depreciation (thereby causing an “internal depreciation” in wages costs in the US, delivering renewed competitiveness and productivity gains for US industries. On the back of QE and deprecation, US exports increased 39% between 2009 and 2014. Consequently, we may be seeing the lagged effects of the cessation of QE spilling over into 2015 as global growth slows. Ah, economists. People who are good with numbers, but lack the personality to be accountants.